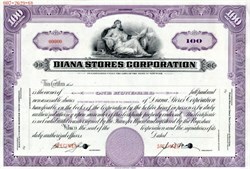 Beautifully engraved certificate from the Diana Stores Corporation printed in 1968. This historic document was printed by the American Banknote Company and has an ornate border around it with a vignette of an allegorical woman. This item has the printed signatures of the Company’s President and Secretary. Great Eastern Mills sold its business and its 50 percent share of Great Eastern Linens to Diana Stores Corporation, a ladies' apparel store chain with a strong market position in the southern United States. Thereupon, Diana Stores opened a chain of stores, named Miller's Discount Department Stores, in which Great Eastern Linens operated the linen and curtain department. Diana Stores later sold its company and its 50 percent interest in Great Eastern Linens to Beverly Hills-based Daylin Inc., a national chain of department stores that leased departments for health and beauty aids.